We are working on a model that merges the growing Earth hypothesis with our own hypothesis and method. We have found encouraging correspondencies but we are still finalizing our own details. We are reviewing the works of Samual Carey, James Maxlow, Jan Koziar, Klaus Vogel, Hugh Owen, and others. Their work is original, profound, and easily verifiable to be 100% true. Academia remains unconvinced and prefers to stay in its parallel fantasy world of papers, fundings, and careers. Contemporary scientists say that there is no evidence for a growing Earth, hence no evidence for a lower gravity in the past. The evidence is in fact so overwhelming that it is next to impossible to claim that there is no evidence for a growing or expanding Earth. The fact is this: the Earth is inexorably moving away from its birthplace, the sun, and in doing so, it grows. Our research results are intriguing. We have found proof that our ancient history is far older than scholars claim. But we have also found proof that the Earth, as we know it today, is far younger than geologists believe. NASA’s observations that the Earth grows at a rate of about 0.1 mm per year seems unquestionable. This growth is measured by using all kinds of advanced techniques like: satellite laser ranging, very-long baseline interferometry, and GPS. The Earth’s radius is not really growing over a period of two decades. This might appear correct, at least for now. The very limited time frame that scientists had to measure a possible expansion was too short to draw conclusions from. Extrapolations based on too less data or too short time frames are not very scientific. The Earth has periods of tranquility, and has periods of severe changes which are caused by growing pains in combination with a high eccentric orbit around the Sun. During these periods of turmoil grows the Earth at a rate of a few meters per year, while in periods of tranquility and blossom everything seems to be stable as ever. Nothing is more untrue. We cannot extrapolate these measurements just like that into the future or the past. Especially when we look at the map of Fig. 1, many of us will immediately understand that this has severe consequences for, indeed, a growing Earth. The same scientists say that the geographical pole did not move over the last million years, while we have delivered 100% proof that this assumption is incorrect. The geographic North pole moved significantly while the geographic South pole hardly changed its position. And indeed, Antarctica is as the only continent surrounded by a ring of expansion, suggesting that it has no mechanism to rapidly move its position. Fig. 1: This map delivers instantaneous evidence for a growing Earth. The red zones are young, expanding fault zones. The greenish blueish areas are the older areas on the sea floor. 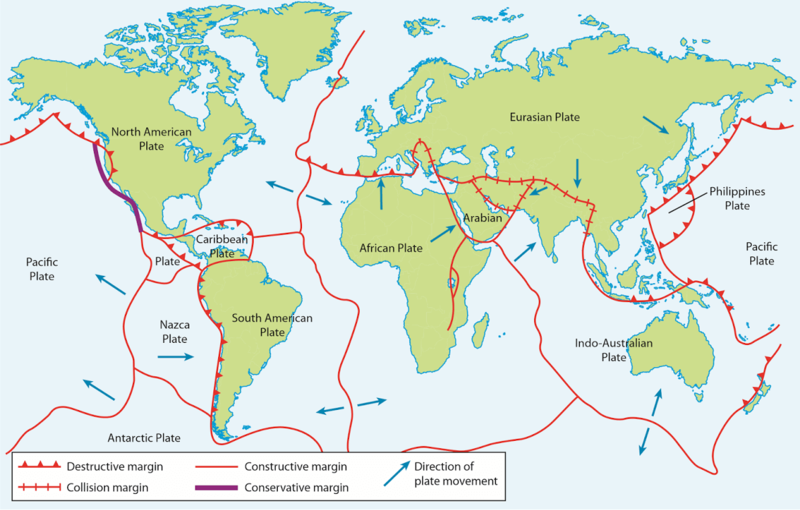 Our reasoning is simple; if the sea floor spreads at the red zones and the Earth does not grow, there would have to be an equal amount of subduction zones at the green/blue areas, otherwise the Earth would grow. Where else would all that material be going to? There are not enough subduction zones present to consume the produced and spreading seafloor. The only way out of this predicament is expansion. The Earth grows from within stretching the crust mainly on the sea floor. Additionally, the continents fit perfectly together on a smaller planet, a planet that is about 50% smaller. That explains in the simplest way why dinosaurs grew so big – when gravity was less. That should be convincing enough to open the door to a whole other paradigm and proves the fact that the establishment is merely busy to keep an outdated and erroneous theory alive. When we look at the map above there are a few interesting things to discover: colors and stretchmarks. Colors stand for age. The stretchmarks shows us the way back how to join the continental shelves together. In most cases the shelves fit together. That was the original idea in the Pangaea theory. Most people understand intuitively that stretchmark paths do not just result coincidentally into matching continental shelves. The likelihood that this is the right approach, in order to understand a much deeper truth, is very high. We also need to join the continental shelves at both sides of the Pacific. Because there is no reason to leave these expansion marks out of the equation. But when we do this the Earth is about 50% smaller. It is easy to understand there was a significant expansion over the last 150 million years, although geology stubbornly denies this. The ideas of geologists and their own data is obviously conflicting. They have a paradigm problem, their believe systems conflicts with the facts. A typical problem that religions also have. Ideas lag behind on facts. The Earth expanded from a diameter of about 6,500 km to a diameter of 12,750 km in 150 million years. On a sliding scale that is an average expansion of only 4.25 cm (1.67 inch) per year. This expansion is hardly noticeable on a short time scale. And when these growing pains are not constant, but go hand in hand with crustal deformations cycles like we have proven with our method, it is very likely there are cycles of sudden growth. Fig. 2: The total length of constructive boundaries is around 60,000 km, while the total length of destructive boundaries is around 35,000 km. There is no balance between construction and destruction. One could argue that the destruction zones “work” about twice as hard as the construction zones in order to maintain the balance. But there is no evidence to support this idea. This unbalance between + and – has severe consequences over long periods of time. When we compare all the data that geology has gathered over the last decennials with their ideas they do not match. Geology behaves dogmatic similar as religions do. Fig. 3: The initial idea that continents were once joined together forming a supercontinent called Pangaea is not at all a bad one but it is half-baked and scientifically incomplete. The point is that if this were correct, then the ocean floor ages that we find in the Pacific (Fig. 1) could not be true – they are of the same ages as the ocean floor between Africa and South-America. If you do the math correctly, you will find that the continents were wrapped around the entire smaller globe. This pattern fits perfectly but demands the acceptance of the fact that, about 200 million years ago, Earth would have to be only about half its present size. Pangaea is a halfhearted attempt to explain Earth’s history. The Pangaea idea, which is unverified and incomplete, attempts to unify the continents on a flat map. The theory neglects the perfect match of the continents on the far right and on the far left of this flat map. Why is that important? Because, as you can see in Fig. 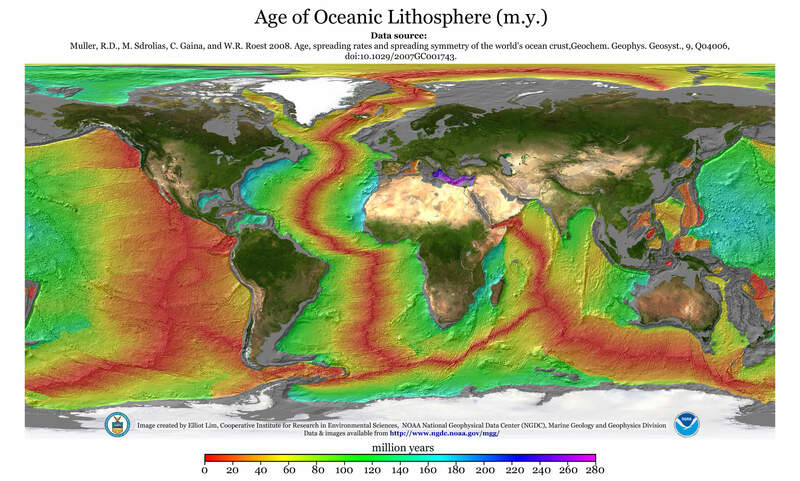 1 above, the age of the ocean floor in the Pacific is of the same spreading age as elsewhere on the globe and therefore all landmasses should be joined together when considering a younger earth. There is no reason to keep the Pacific spreading out of the equation. The only correct conclusion is: the Earth must have been significantly smaller back then. This can best be visualized on a sphere and not on a flat plane. However, such modeling is quite difficult and most geologists seem to lack the spatial insight to visualize this. That is why we are working on a new model that is supported by the age-dating method that we have already proven to be correct. Are Narratives of Floods and Giants True? Fig. 4: Popular science exists merely to entertain the masses. Those who have the capacity of a deeper understanding know that a giraffe could never fly in our present gravity, nor could the huge pterosaurs. The weight-muscle strength ratio does not allow this. However, in their era, their gravity was between 25% and 50% of what it is today. That is the reason why such huge beasts could become airborne in their days. Reconstructing these animals like in Jurassic Park using ancient DNA would end in a disaster for these animals. The narratives of floods and giants are not as unlikely as they seem at first hand. Lower gravity encouraged life to grow to much larger proportions like in the era of the dinosaurs. Virtually all life on Earth was bigger then. 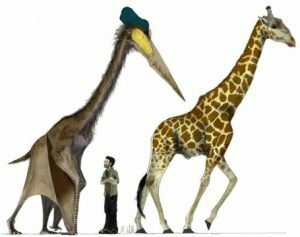 Could a flying dinosaur, called pterosaurs, like the massive Quetzalcoatlus fly in our gravity? No, of course, they could not. That is simply impossible, they would not even be able to stand on their own legs without support. The dinosaurs that we see in Jurassic Park could not remain standing on their legs without collapsing under their own weight. Would it be a coincidence that the most antique sea, the area of the Old Testament, is located in the Mediterranean? The whole area surrounding the Mediterranean is littered with very ancient ruins. Myths of giants in very ancient times? There is increasing evidence that indeed giants wandered the Earth over more than 250 million years ago. Live evolved and shrunk with an increasing gravity. Violent floods, megaquakes and massive volcano eruptions, that were caused by the growing pains of Mother Earth, made sure that new evolving life was not obstructed by the old guards. Science calls them extinctions events. When gravity increased – when the Earth grew further – the dinosaurs became extinct and were replaced by smaller-sized animals. Once you understand this concept, it is so simple that even a first grader can grasp it. We do not deny meteor impacts. But massive impacts and extinction events are connected to each other as if that would be the only possibility. It is easy to understand that an increasing gravity combined with meteor impacts also leads to extinction. There is no factual basis to remove one aspect from the equation while leaving others in. Contemporary science has shown us already many times to behave as a new form of religion – a sort of modern Catholic church – neglecting facts, condemning new ideas and persecuting heretics. Our new hypothesis explains quite elegantly why geology and archaeology have never found a common ground: because they both live in parallel, and still incorrect academic worlds. Fig. 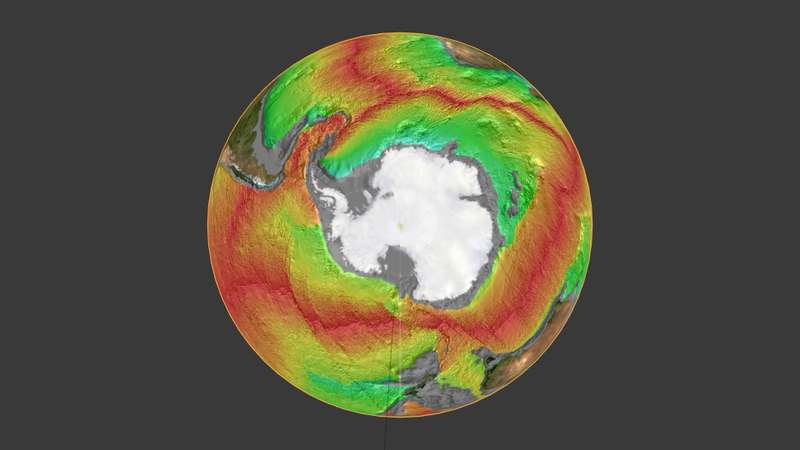 5: Antarctica remained at a fairly stable position because it is surrounded by a ring of expansion. The North pole migrates all the time due to unbalanced expansions. The other continents are pushed around due to unbalanced expansions as well. This explains easily in our method why the North pole moved around while Antarctica hardly changed its position over the last few million years. This explains in the simplest possible way that most continents are located on the Northern hemisphere – they are pushed in that direction by Antartica, the only continent that has a ring of expansion. More than 50% of the surface area of the sea bed is younger than 100 million years. The oldest sea floors are in the Mediterranean around the most ancient cultures like Greece, Italy, Syria, and Turkey. If Pangaea would be true then the sea floor age mapping of the Pacific is not true. It is impossible to maintain both paradigms. Pangaea is just an idea, the sea floor age mapping are hard data. The sum of all subduction zones and all expansion zones is NOT in balance, leaving no other option than that the crust grows. The quotation is so simple that scientists are overlooking the facts. If the Earth grows then Physics and science in general has a major problem: where is the matter coming from? Where is the Matter Coming From? Some scientists still believe that the mass of the universe is constant. They also like to dismiss the existence of dark matter because it is inconvenient for their theories. The universe is infinite, it contains an infinite amount of mass, it still expands, while mass is constantly added. How these mechanisms work is still very poorly understood. Within a century from now almost everyone will laugh at the idea that the Earth never grew. Believing that the Earth does NOT grow is similar as believing that the Earth is flat. But where is the mass coming from to make the Earth to grow? And why doesn’t it grow at a constant rate? Good questions. As soon as we have gathered more information we will share this. In the meantime, you can support our work. Great article. It works really well for me. I spent a lot of time to locate something such as this. Please consider the work of Wal Thornhill and David Talbott of “The Saturn Myth.” Their work ties in directly with what you’re doing. Also, look up the Ganymede hypothesis. Thank you for the reference and link, Pete. Very interesting. I already found the answer to my last question. The mass of the Earth depends on the volume and the volume of a sphere has the radius cubed in the formula. Because of this the effect of the growing Earth has relatively more influence on gravity than the increasing distance between the Sun and the Earth. This website estimates the increase in distance per year at 1,5 cm. I have a question about the larger gravity. When the Earth grows, the mass increases. That is a way to explain the increasing gravity. On the other hand, the distance between the Earth and the Sun also increases, and according to this gravity would decrease much more. Wouldn’t this effect have more influence on gravity and doesn’t it contradict with what we experience: increasing gravity? Or is the mass of the Earth increasing much more rapidly than the distance between the Sun and the Earth? Following my latest comment about the work of Karl Zeller and Ned Nikolov, let me try to see how this fits the growing Earth model. There are 2 separate movements. The first is the eccentricity which causes the Earth to be closer or further away from the Sun during the orbit. The second movement is the Earth moving further away from the Sun. Is there an explanation for this second movement? Because of the Earth moving away from the Sun, the rotational speed of the inner core is getting higher. This has to do with a larger arm over which the magnetic forces of the Sun act on the inner core of the Earth. To keep the balance the outer layer of the Earth slows down its rotational speed. Because of this the centripetal force of this layer gets lower. This causes the landmass to move away from one another. The crust of the Earth is the heaviest at the landmasses while the crust is less heavy at the sea beds. Because of this the sea beds are the location where any expansion will happen. This part of the Earth grows, while possibly other layers are compressed or decompressed. The atmosphere could be compressed, while the inner fluid layers could decompress. The outer layer will get a lower rotational speed, while the inner core will increase its rotational speed. The research about ringwoodite (Mg2SiO4) shows that water is locked inside the Earth’s core. When the core will rotate faster, the centripetal force of the core will increase and this will cause the locked in water to be pushed to the outer layer, where it fills the voids that are created by the growing Earth. The opposite rotations of the outer layer and the inner core I am quite sure are what you missed: the law of Gender. When this is implemented in your research, we can most probably start to see that gravity is only an effect of electricity and magnetism, which is even written by Isaac Newton himself. Gravity on our planet depends on the rotation speed of the inner core, which causes the electromagnetic field of the Earth. Another thing that makes me assume the 2 opposite rotations of the Earth is that all these hundreds of thousands of years, the spin axis did hardly change as you mention. With a spinning top, that would not be the case. The spin axis would change its orientation when the Earth rotates slower. With a gyroscope that the spin axis would remain in the same position. I am just placing some additional comments that might be useful to you. I can only come up with basic logical thinking, but possibly you find it interesting and are able to look into the mathematics. Have you considered that a significantly higher atmospheric mass in the past could cause buoyancy and hence a lower gravity? No, we haven’t. I’m interested, why would you suggest this? And based on which mechanism or process would you consider this possibility? The volume and density would seem to vary due to the expansion of the spherical surface area. Even so, the atmosphere is in itself variable and could increase or decrease in density dependent on the radial distance from the center. Hello Mario, it’s great to see you covering the subject in this manner. Good to know brilliant minds think alike. Ha! The Expanding Earth Model is a no brainer and only lacks a good model to explain it. I’ve watched all the old Neil Adams videos and generally agree with his renderings, however I still think subduction zones also play into and compliment the model considering the expanding is not even or constant, thus causing some areas to “overlap”. The folks over at the Electric Universe ( Thunderbolts Project, YouTube ) are on to something for a possible explanation has the Earth as a hollow geode with a plasma interior which receives its expanding pressure / energy through the poles. Definitely gives the Hollow Earth theory a new twist and possible new life as well. Truth is stranger than fiction. Keep up the great work and look forward to future postings. Thank you for your comment, Kreg. We are still working on our model, which will still take some time before it can be published. No matter how good renderings might look, there has to be a well understood mechanism underneath. There are many theories out there about a possible hollow earth. There is a big problem for the hollow earth, and that is that Newton’s law F=(GmM)/r^2 has been proven to work perfectly well, not only for revolving planets, but also for satellites and all sorts of space travelling. There is no evidence that the planetary masses are incorrectly calculated, hence it is quite unlikely to be hollow or filled with plasma. On the other hand, if the plasma would “simulate” a mass similarly as a massive planet, that could explain some things. We don’t see currently how that could work. Our model is still based on an increasing density closer to the core and as far as we have developed our model that could actually work for a growing Earth. MB, thank you for your detailed reply, it really pulls all the threads together using simple physics but on a planetary scale, which I think is easy to see in a science class but hard to imagine a planet doing it and over a longer period and of time with such devastating effects. This would also explain the pole shifts in your theory, the direction linked to the Pacific expansion(possibly?). I really hope you and your team get recognition for this, it is brilliant. MB, interesting concept. The more I read about on this and other sites the more I realise we really know very little and the true facts are probably stranger still. Would your theory have affected time, and the concept of it for the people living at that time? For example in the Bible and Sumerian text it speaks of people living for thousands or hundreds of years (and giants!) making scholars comment that these were myths. But if at that time days and years were much shorter (faster spin and or tighter orbit) then potentially a year could be a week or a month? I appreciate that may be extreme but you get my drift? I’ve also realised that because we have only been monitoring our solar system for a very limited time, any conclusions that have been made are probably speculation, or a ‘best guess’. Additionally you read about our galaxy ‘capturing stars’ and colliding with smaller galaxies then you realise the potential cosmic chaos that would cause if our planet was originally in another galaxy or orbiting a different sun but ended up here and that affected the earth causing it to expand. Who knows? Thank you for your comment, Terry. You are spot on. One of the few consequences of a growing Earth is that Earth’s orbit was closer to the Sun, and that the rotation speed of the Earth was higher. The rates depend not only on diameter but also on mass. We could claim that an ancient Earth with a diameter of 70% has only a mass of 49% of what it is today (mass and volume grow quadratic with diameter, so an equal density Earth with diameter of 70% has a mass of 0.7*0.7=0.49=49%). An Earth with a diameter of 50% would have a mass of only 25%. Lower mass means lower gravity. With all this reason there is a big “but”. The density of the inner core will probably grow with an increasing diameter due to the growing pressure on the inside. That would mean that the mass and gravity increase more rapidly than the diameter would indicate. What that means is that gravity was somewhat lower than the above mentioned figures and that has consequences on the rotation speed, that would have been slightly higher back then (conservation of momentum). To make the whole idea more simple, we are certain in one thing; Earth’s mass was significantly lower some 200 million years ago and so were the days much shorter as well as the years. So time measuring was completely different than it is today, and that means that the Earth could be much younger than science has been speculating about. Just spent my Sunday morning following the people you reference at the start of this web page; found this page but can’t link on here called checktheevidence.com. It explains the expansion theory, with maths, right up your street! Thanks again. Hi Terry, the people that are referenced to like Samual Carey, James Maxlow, Jan Koziar, Klaus Vogel, and Hugh Owen have published interesting work about this topic. The website you mention looks and feels somewhat like a conspiracist website that sweeps all topics on one big heap and therefore misses the nuances, like the idea the Earth would be hollow. If that would be so gravity would not significantly increase with an increasing diameter. That contradicts all logic. Mario, I have heard from various sources, that the Earth might be hollow, as it produces a ringing sound like most planets and stars. So if the Earth is growing, and following my logic and all the available evidence I am dead certain that it is so, the only question remains to find a model that would incorporate bits from other theories that could fit this, like the Pangea idea. 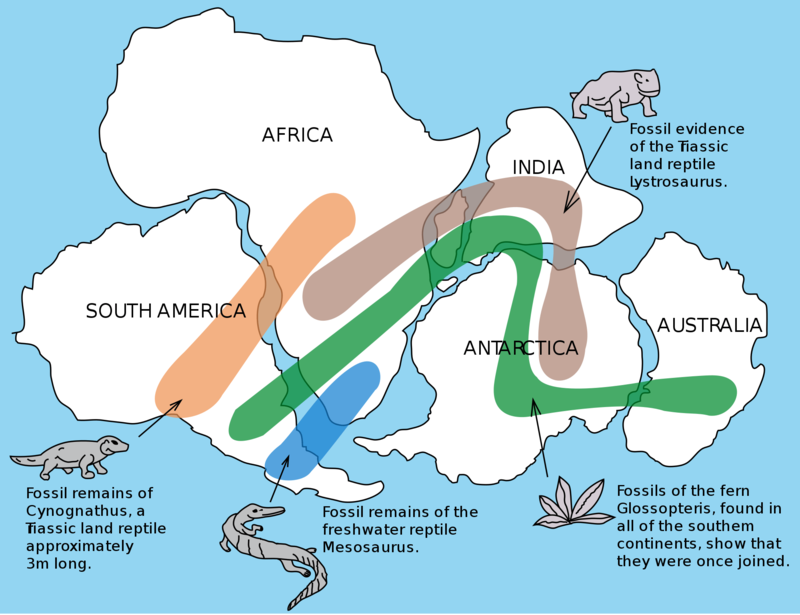 It makes perfect sense that there was a super continent that broke up into present ones. However this is only half the truth, the other half is that super continent was in fact a continuous mantle that completely enveloped the Earth, and that the Earth therefore had to be smaller. Evidence is abundant about this, corals producing over 400 layers a year instead of 365 as today indicate faster spinning globe in the past, dinosaurs were able to grow gigantic sizes indicate lower gravity and more oxygen in the atmosphere, (also atmospheric pressure higher, like now in the water whales can grow bigger with less gravity because of their buoyancy but higher pressure). But if the Earth grows from within, that alone doesn’t explain the growing gravity unless there is an outside source of material,or energy that would be converted into material. If you compress material, it only alters it’s density not it’s mass. That would be true the other way around, like a weather balloon that expands as it gets higher in the thinner atmosphere. Also if the mass doesn’t increase drastically as the Earth expands, the gravity on the surface would lessen due to the increase of distance from the core. However in our world everything is connected, meaning there are no isolated systems, the lower gravity in the past (100+million years ago) would also be effected by the faster spinning ball of the Earth due to the centrifugal force, making objects lighter on the surface. So the slower spinning would help to increase gravity. So there are questions, but I am confident that someone will come up with the correct assumption about the past and able to prove the current scientific community wrong and that they should really open up their mind and look at the overwhelming fresh evidence today. The probability that the earth could be hollow is very unlikely. The orbital models on which satellites are shot to distant planets is based on the same theories and they work perfectly. The moon causes tides while it orbits the earth. Some things do not need to be overturned, they are simple and good. But there is a serious problem in geology with the isochrons from the ocean floor – they undoubtedly prove that the earth has grown. The flying dinosaurs only strengthen this idea. The material for the earth to grow might come from the sun, cosmic dust, micro novas, supernovas, and probably sources we don’t know yet. Regarding the gravity/mass hypothesis, I believe that it would be necessary to elaborate on why the Earth has gained so much mass in the past few million years. If it is by means of cosmic dust or meteor showers falling onto the surface, a few sources that I found state that the average intake is about 50k-100k tons / year, which more or less balances out the ejection of atmospheric gases of around ~50k tons / year (resulting probably in a yearly net loss of mass). If no significant additional mass is added, then of course an increase in the Earth’s radius (with constant mass) would result in a lower surface gravity acceleration (supposing, of course, a constant angular velocity of rotation). So we will probably require an explanation about the origin of a significant amount of new material, unless a major change in rotational speed is to be required. Thank you for your comment, Pedro. Two photons can create a positron and a neutron. Photons a massless, while positrons and neutrons have mass. So, light can create mass. Mass to make the earth grow can come from many sources: cosmic dust, meteors, cosmic radiation, micro novas, novas, supernovas. We simply do not know yet where it all came from. The mass of the earth has grown, there is in fact no way to argue around that rationally. Thanks for your contribution. Very interesting and plausable theory – keep up the good work. Real science is all about challenging the unproven theories and mainstream dogmas. Looking forward to read more about your excellent work and findings. Hi Thomas, thank you for your kind comment. More on this topic will follow in the future.